See more on our Essential range in acoustic and compact versions with tile, plank and roll formats and whole new designs. Tarkett provided all of the floors for brand-new AZ Alma hospital in Eeklo (Belgium). iQ flooring solutions were particularly suited to the hospital's requirements. 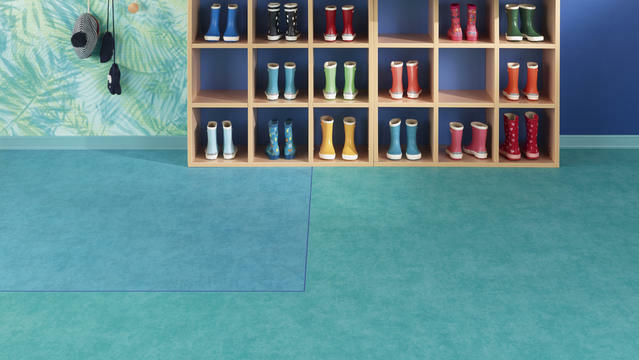 Acczent Excellence 80 is one of the most creative heavy-traffic vinyl flooring ranges on the market, with a durable resistance to indentation (0,01mm). With 127 décors and colours, in matt finish, it offers endless possibilities to create inspiring interiors. It is treated with our trademarked Top Clean XP surface protection for extreme durability and cost-effective maintenance. Also available as tiles and in acoustic format with Tapiflex Excellence 65, this collection is part of a fully-integrated solution including wall coverings, wetroom options and accessories.